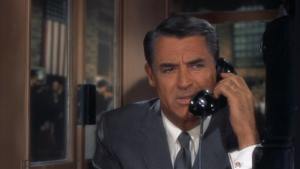 If you love classic movies, you undoubtedly enjoy watching Cary Grant films. His unforgettable roles in Hitchcock works, romantic and comedy movies make him one of the greatest movie stars of the previous century. Here are 3 of the “must-see” movies that you will certainly fall in love with. Of course, if you already don’t love them. “His Girl Friday” is a hilarious screwball comedy, starring Rosalind Russel and Ralph Bellamy together with an outstanding Cary Grant. This 1940 movie is actually the remake of the play by Ben Hecht and Charles MacArthur. The story is about the newspaper businessmen and Grant plays an irresistible editor. Superb comedy with funny twists. “Holiday”, movie from 1938 directed by George Cukor is really a must see. Cary Grant and Katherine Hepburn indeed have an amazing chemistry together. Grant shows off not only his acting potential, but tumbling skills as well. The movie is really a gem about materialism, wealth, society, people who follow or lose their dreams. Johnny Case (Grant) is a young businessmen who takes time out from the job to experience the society and the world around him. Even though he gets engaged to Julia, his sister Linda (Hepburn) is secretly in love with him. After realizing they are too different, Julia and Johnny decide not to get married and finally, Linda gets Johnny for herself. “North by Northwest” an incredible movie by Alfred Hitchcock, so alike all his movies – combination of intrigue, humor and, of course, suspense. Roger O. Thornhill (Grant) is an regular guy living his common life and minding own biz, until out of the sudden he gets mistaken for an agent by accident. From that day, Roger mistaken for George Kaplan, is beeing chased everywhere by a spy’s Van Damm’s men. Roger gets involved with Eve Kendall (starring Eva Marie Saint) not knowing that she is also one of the Van Damm’s spies.